Attention, game geeks and card crazies, this week at Dice Hate Me, I’m going Looney! Starting Wednesday, I’ll be doing back-to-back-to-back reviews of three of Looney Labs‘ greatest hits: Aquarius, Chrononauts and Monty Python Fluxx. 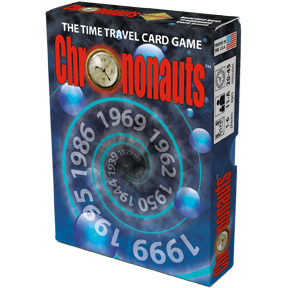 These card games use several of the same insane mechanics, but manage to create three very different and unique game experiences. I found two to be absolute gems and one to mildly resemble fools’ gold. Which is which? Check back each day this week to find out! 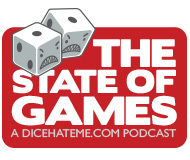 1) Head over to the Dice Hate Me Facebook page and hit the “like” button. Everyone who “likes” or tweets about Dice Hate Me by midnight, Saturday Sept. 25 will get one entry in the drawing. BONUS: Anyone who subscribes to the Dice Hate Me mailing list by midnight, Saturday Sept. 25 will receive an additional entry! It’s just that easy! 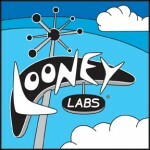 So get out there, spread the word, and be sure to check back all week long for Looney reviews.